Home » Writing » I’ve written a novel in a month ..
I’ve written a novel in a month .. The power of social learning? I’d a two hour an online meet up on Tuesday – and topped 1,200 words. On Sunday as eight writers met in a café in Brighton to write. 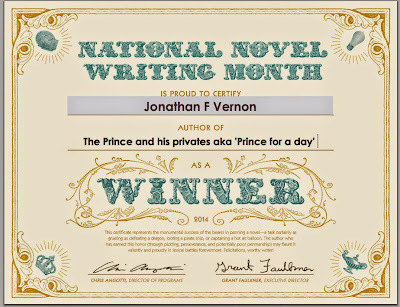 This ‘Write a novel in a month’ has over 200,000 participants – novels are written at these events and published. We’ll have to see what I can do. There’ll be a dedication to The OU should it ever comes out. As there is a fabulously vibrant Massive Open Online Course (MOOC) they are running on FutureLearn “Start Writing Fiction’ that has put the emphasis on character – another month to run on this. It is free. The OU BA in Creative Writing runs for several years. It works. There are plenty of published authors. I’ve written on about blogging and its worth for over 14 years. Regularly kindly people have suggested I stop blogging and put my energy into writing fiction. 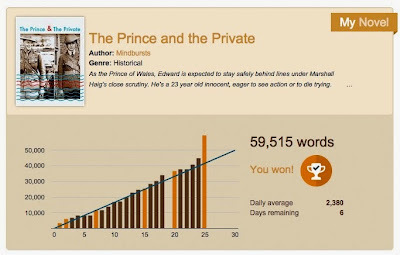 Courtesy of FutureLearn ‘Start Writing Fiction’ (From The OU) and the Write a Novel in A Month think for November I have duly written close to 60,000 words. This first draft, I understand, could take two or three months to edit – that will be the next step. Gladly my early morning hour or two has been spent on this, rather than stacking up things to blog about. Instead I have fretted about scenes, characters and plots. The FutureLearn MOOC became apt and timely ‘applied’ learning as I’d had to write 1,600 words a day – today I topped 4,500. More than any MOOC I’ve ever done I feel certain that this will convert some for doing a freebie to becoming students. It’ll be interesting to see what the take up it. I know the percentages from OpenLearn are very modest 0.7% being a good figure. I’ll reflect on what this means in due course. Learning promoted like the Lotto? With badges, prizes, write-ins, writing wars … and more prizes, and tips and incentives. What I think it means for e-learning and what personally I have picked up. I shouldn’t fret about TMAs anymore. You do a marathon and a short run ought to feel like something I can do in my stride. I always wished I could write first drafts under exam conditions then edit. By Jonathan Vernon in Writing on November 27, 2014 . Hi Jonathan, just used the link to your blog. Do you have any specific fiction writing content on here, as related to the Future Learn course? I see my wordpress blog has come up. I haven’t added anything to that one in ages having become very disillusioned with the whole topic. I think you know my Future Learn blog address. Any comments on that I’d love to have. Interesting article about the motorbike ambulance. I have an interest in the history of nursing and medicine. My husband does a talk on the surgical lessons of war. He’s a retired surgeon. I haven’t blogged about this course, though I blogged about writing for many years 1999-2006 or so. I should have got more produced or published by now. Very interested in the First World War: currently attempting a second novel set mostly in 1916/17.